We've been to the Hula Festival -- or Ho'olaulea -- 3 years in a row. It's set in a huge park in Lawndale, and people set up tents and big blankets and plan to stay all day. The dancing is amazing, and ranges from very authentic to very Missionary-style, if you know what I mean. They have food booths like you wouldn't believe -- all the favorites from lau-laus to shave ice to kal bi ribs to chicken long rice, teriyaki steak, 2 scoops rice and macaroni salad. And then, as if that's not enough, they also always have tons of booths filled with Hawaiian stuff for sale -- clothes, T-shirts, bags, blankets, books, and you get the picture. Tons of fun -- our family wouldn't miss it. Usually mid-July every year. Thanks for the report, Sarah! These beautiful hula photos I found on this site. 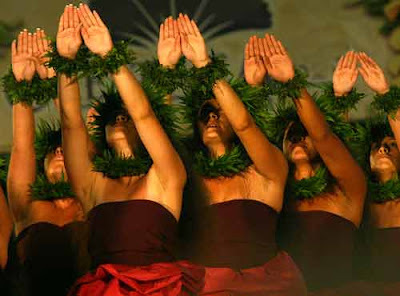 They are from the Merrie Monarch Festival 2005. Honestly, guys dancing hula? Doing chants? Nothing sexier. July 14 and 15 this year -- mark your calendars!